stay-cation here in our lovely city of Edinburgh! If I get any good pics, I'll share them with you! who kindly gave me permission to use it on a card & to blog it! Thanks Ana, I love you & your pic too as you already know! & I love using the twine on cards as it gives a great rustic feel! The buttons are from my stash! I hope you have a fabulous week off and looking forward to seeing some of your stunning Photographs. A simply gorgeous anniversary card Dawn, love the topper and the sentiment is fabulous. So sweet! 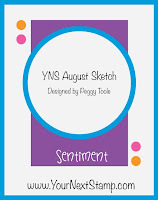 Thank you for playing along with our YNS August challenge! A fabulous image and sentiment for an anniversary card. Love it. Hope you have a good time in Edinburgh. Love, love, LOVE the kraft and green combo, Dawn! Spectacular CAS card. Hi Dawn, a brilliant card, made me chuckle. Fab card Dawn. The chocolate lime (mmmmmmm) colour combo seems to be pretty 'in' right now. Not good for my diet, though, as it makes me want some sweeties! Fabulous card. Wonderful anniversary card - love the photo! Thanks for playing along with the Bloggers Challenge! What a cute little card, Dawn - thanx for sharing with us at Polkadoodles. What a fun way to use a photo - and against the green it looks perfect. Thanks for joining in the fun at YNS!!! Great card. Love the rustic twine. Thank you so much for joining in with our ‘ribbon or twine’ challenge at the As You Like It Challenge.